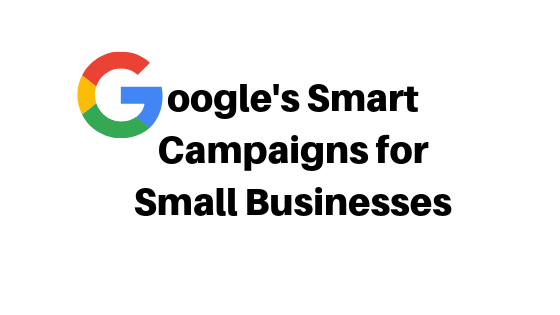 Smart Campaigns is the first truly tailored to small businesses solution from Google using the company’s bespoke machine learning technology. Until now small businesses relied upon Google Ads by customising and manually adjusting them to fit their needs. Google is now making the process much more simple to help advertisers with limited budgets and knowledge take advantage of the newest technology. Until now if you were running a small business you many of the most innovative features of Google like Smart Display Campaigns, Smart Shopping or Smart Bidding strategies were not the best solution. The problem with these campaigns is that they require a substantial amount of conversion data and high daly budget caps to perform at their best. Officially now you are not required to have any conversions recorded before starting with a smart bidding strategy, but still these would take much longer learning period if you lack the data. Second, these campaigns are designed to increase your spend and increase your results too. Therefore if budgets are capped low, they cannot perform. This has been a source of frustration amongst smaller advertisers which saw these innovations inaccessible due to the high price tag. What are the small business’ needs? These are fully automated campaigns which take the bidding, targeting and creative design away from the control of the advertiser. This is a good thing, if you are a small business owner. You are not likely to have a designer at your side to make 10-15 display banners from each size in each ad copy variation you want to test. You probably have no knowledge about the different audience types in Google(which increase and develop constantly). Also one of the most scarce assets for you is time. Adjusting bids, testing creatives and optimising simply takes too much time and requires solid analytical skills. Studies also show that in Google Ads and not only testing various creatives is one of the biggest contributor to success. Another problem is the types of campaigns you can afford to run simultaneously. Until recently to run campaigns on the different Google properties you needed a separate campaign for each of them – one for search, one for Display, a separate for Gmail and for YouTube. You also had no access to advertise on properties like Google Maps, which is where local businesses have most interest to show up. Studies show that people checking a business on Google maps are 90% likely to walk in the store in the next 24 hours. This is why business owners relying on local traffic must really focus on improving their Google My Business account and make sure all relevant information is there. How much Smart Campaigns cost? Smart campaigns are a tool for a small local business. This campaign type solves a lot of the problems for a small business owner, who is willing to run ads for themselves. First of all the are extremely easy to set up. It does not cost anything to access Google Ads and create a very simple local campaign. All you need to set up is your budget. You will be charged either per click or per phone call from the ad. The cost depends on competition, the relevancy of your ad and how likely a user is to buy(Your bids will be automatically raised for high purchase intent users clicking on the ad). You will get a recommended budget based on what advertisers like you are spending. Your budget is per month, so multiplying a daily budget by 30.4. Smart campaigns allow you to advertise across Google Search, Google Maps and the Google Display network simultaneously. You only need to provide a link to your website, headline, ad text and preferably a pin on Google Maps with your address and phone number. This can be done by creating a Google My Business profile and verifying your location. Google will take content from your website and create alternative ads to test different messages automatically. To appear across the Google Display network, you will need an image, business name and a logo, too. They will be automatically mixed and matched to fit in available placements on publisher websites like news papers, blogs and other websites. If you don’t want to use display ads, you can request to opt out, but it will decrease your reach. Your ads will be shown to people making searches related to the content on your website. Instead of manually selecting keywords, which could be challenging at first, Google will automatically match queries from a user to what you offer on your website. On display Google will use audience signals to target people who have been on your website, people with similar online behaviour or the ones who are likely to buy a product like the one you offer. The role of Machine Learning? Machine learning is at the core of Google’s success of advertising solutions. This is technology which uses data like clicks, ratio between impressions and clicks, geographical location and time of the day to understand when the best times to show an ad are. Also since Google has billions of signed in users coming with intent to find solutions the ads can be shown to the user who is most likely to be interested in this ad. This is based on signals like the user’s behaviour online, what they search, what other ads they click, which websites they spend their time on. All these signals give a rounded view of the user and their real recent interests and needs. Online marketing for small businesses is becoming easier and more simplified. Solutions from both, Facebook and Google provide opportunities for business owners who never spent any money for online ads start using these solutions and get tangible results. The drive towards more automation and less control is aimed to help small business owners. Bigger businesses still have a lot of access to customization, but they also move towards automated campaigns with a lot of success. Campaigns which require less maintenance free up time for marketers to focus on measuring profitability and taking strategic decisions. This will lead to gradual change of required skills and the whole scope of online marketing jobs. All the views in this article are exclusively mine and I am not an official spokesman of Google. This entry was posted in Google Adwords, PPC and tagged audiences, automation, Gmail ads, google display network, google maps, smart bidding, video marketing.